Deploy cutting-edge Artificial Intelligence (AI) to respond faster and convert more leads. Your chatbot is always working…even when you aren’t! Respond to new leads in seconds! Your automated real estate chatbot is standing by 24/7 to chat with prospects and collect leads. Even when you’re sleeping or working with other clients! Chatbot users LOVE our quick-reply buttons! Your chatbot will even record the answers to questions and email you the results. Be sure to check out our video to see them in action! 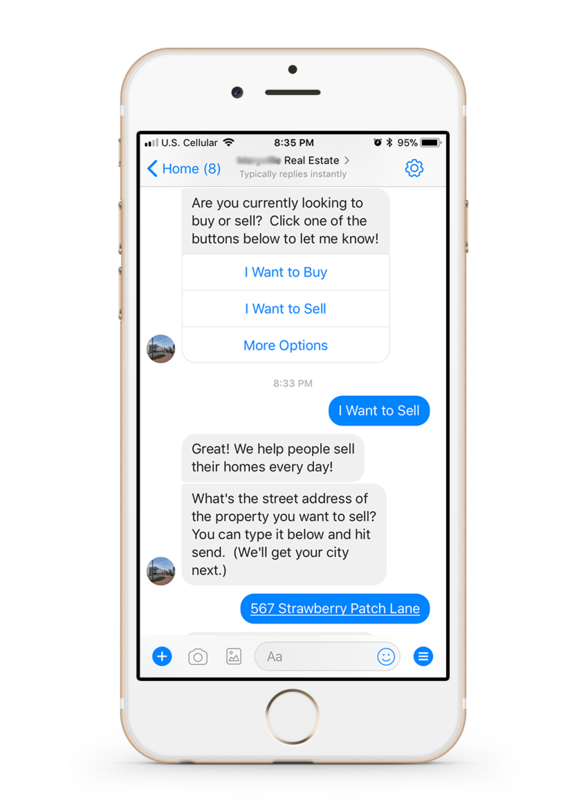 Realty Chatbot advances each lead opportunity by modifying the conversation flow based on how your visitor responds. New modules are constantly expanding your chatbot’s capabilities. Our quick-reply buttons make it easy for users to answer with a single tap! This moves the conversation along quicker and increases your lead conversion. When a user taps one of the available responses it automatically inserts their answer into the message chat. You can login to Facebook and view the entire message history at anytime! We also send you an email with lead details when they provide a phone number or email! Some questions are better suited for a typed response. User responses are included in the emails we send you after contact info is obtained. Your lead details are emailed to you instantly. This makes follow-up quick and easy. Additional details are always provided when available. This includes seller property information, buyer showing requests, referral details, and much more! Converting buyers and sellers into leads is one of your chatbot’s core features. Your chatbot can help buyers request showings, and sellers can provide information about the property they’d like to sell. At the end of the chat, the conversation details will be emailed to you automatically for follow-up. Chatbots allow you to respond instantly and still have a life! You already know that buyers are very impatient these days. In fact, many buyers will call one agent after another until they find someone who can help immediately. Stop losing out on these leads! Our showing request conversation flow allows leads to request a showing via your chatbot! (Leads are always informed that you will follow-up to confirm.) It’s like having a dedicated scheduling assistant! Now your leads will feel like they can move on to other tasks instead of looking for other agents! Referrals are a large source of income for many agents. Fortunately our Referrals module makes it easy to generate new referral leads! People who use your chatbot will have the option to “Refer a Friend”. This prompts people to provide referrals when they might not have thought to do so! This is one of the most valuable modules and a single referral can easily pay for your entire chatbot! Realty Chatbot can recognize certain words that indicate a visitor is probably looking to rent or lease. When this happens, the renter conversation flow kicks in to gather more details. This is invaluable for 2 reasons. First, it helps you generate tenant and rental leads. Second, it prevents agents who don’t specialize in property management from having their workflow interrupted! Our commercial real estate chatbot is extremely effective at converting incoming leads. It’s also very flexible, and there are two versions available. 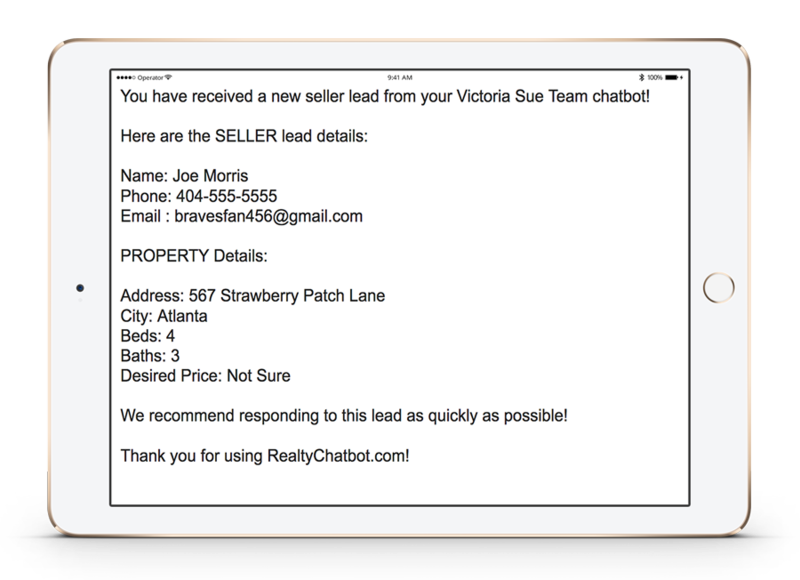 One version is included in the Realty Chatbot PRO plan; this is for agents with residential and commercial clients. Second, we have a commercial-only version available for commercial agents who do not service residential customers. Whether it’s a lease or a sale, your commercial chatbot will be standing by to convert! And more conversation flows are in the works! Your chatbot will automatically be updated as they are released. Don’t Need All of the Conversation Flows Listed Above? I’m Ready to Buy Now! We are constantly updating the core chatbot code and conversation flows. This means your chatbot will always be getting smarter and more advanced. New capabilities are being added weekly! Deploy a Realty Chatbot for as little as $3.96 per day! It would cost thousands of dollars per month to staff a full-time human response team. Chatbots cost a fraction of what they can generate! Our chatbots integrate with Facebook Messenger, your FB business page, and even your own website! This allows you to engage customers almost anywhere. Best of all, we set everything up for you!